A new bioherbicide is in the works that will offer Canadian growers another tool in integrated weed management. (Top to bottom) Dandelion untreated with Phoma macrostoma, dandelion after one post-emergent application, and dandelion after two post-emergent applications. Photo courtesy of Premier Tech. A new bioherbicide could be in the hands of Canadian farmers soon. The product, which utilizes a fungus found in Canada thistle called Phoma macrostoma, is able to control a range of broadleaf weeds and was initially developed by Agriculture and Agri-Food Canada researchers. The technology has been patented in more than a dozen countries, and here in Canada, a Quebec firm is getting closer to commercializing the selective bioherbicide. Premier Tech, which signed a licensing agreement with AAFC in January 2017, is currently working on reducing production costs so Phoma can realize its full market potential and become a commercial success. According to Louis Simard, product development director for Premier Tech, commercialization is likely still a year or two away. Serge Gagne, innovation, research and development director for the Premier Tech Biotechnology Business Unit, says the firm is also focusing on coming up with the right formulation for field applications. Simard says Premier Tech has assembled a registration team to speed up the process when the time comes to register the final product with Health Canada’s Pest Management Regulatory Agency. Michelle Hubbard, an AAFC research scientist based in Swift Current, Sask., who first became involved in the Phoma project in 2012, continues to provide background data to Premier Tech to assist in its commercialization of the product. According to Hubbard, Phoma was isolated from Canada thistle plants by AAFC researchers in Saskatchewan in the 1990s. “When it occurs in nature, the fungus will cause relatively minor photobleaching. [Infected] thistles will be lime green or yellow or white but it’s relatively mild as a pathogen in nature,” she says. (Left to right) Dandelion untreated with Phoma macrostoma and weed after pre-emergent application. 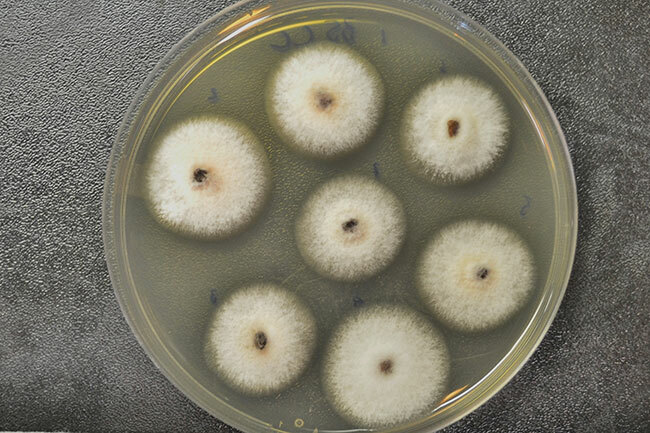 Phoma macrostoma colonies in a Petri dish. Other weeds controlled by Phoma include clover, wild mustard and ragweed. The fungus does not affect grassy weeds or crops such as wheat, barley, oats and millet. Following the discovery of the fungus, the federal government invested millions of dollars over nearly 10 years in research on Phoma and its compounds called macrocidins, which are phytotoxins produced by the fungus during its growth. Hubbard notes that what makes the bioherbicide particularly effective is that it has both a living and a chemical component. “It has two main modes of action, one being a living fungus in the product that will grow out of the granule and colonize the plant root and continue to grow in the plant and cause symptoms that way,” she says. AAFC research into Phoma macrostoma showed that weed control is achieved when a granular formulation of the fungus is applied to moderately moist soil when the air temperature is between 10 C and 30 C. AAFC trials have demonstrated between 80 and 100 per cent control of dandelion and wild mustard, and between 50 and 80 per cent control of Canada thistle. 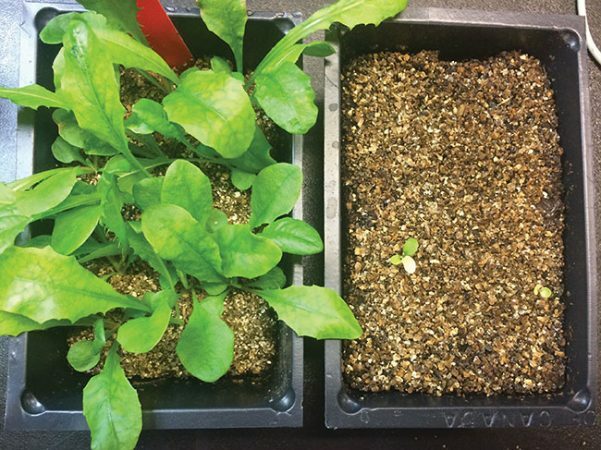 According to AAFC, the selective bioherbicide has limited mobility in the soil because growth is primarily by mycelial fragments, which means it stays mostly where it is placed. The fungus is not very competitive with other soil mycoflora and its presence declines with time. 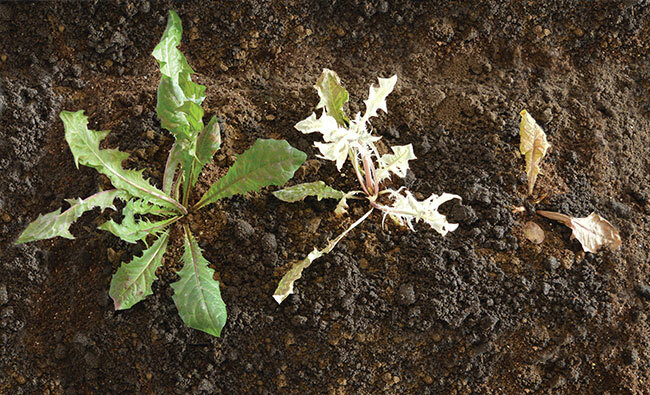 AAFC research also indicates that one year after application, the bioherbicide is rarely detected in the soil and there are few carryover effects to non-target plants. Above 30 C, its growth is curtailed. Hubbard notes the Phoma macrostoma fungus has minimal impact on the environment and is considered safe even at high doses for people, animals and aquatic life: “It’s a safer alternative to synthetic herbicides,” she says. Hubbard says the product has a long shelf life, which will appeal to farmers, and she sees it as a very helpful tool in organic farming, where Canada thistle is a major problem, as well as in conventional agriculture for crops such as wheat, barley and established alfalfa. Gagne says Premier Tech will likely initially target organic agriculture, where there are fewer weed control solutions available to growers. The company plans to eventually market the bioherbicide to other farmers as well, as a complementary tool for use in integrated weed management systems.